WebWatchBot is monitoring and analysis software for web sites and IP devices. Maximize availability through accurate, in-depth monitoring and alerting functionality. 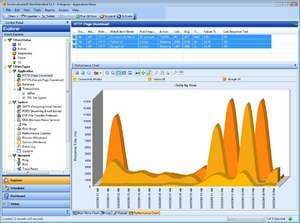 Analyze historical data for trends and visualize current state with real-time charting and graphs. 8 different monitoring types: Ping, HTTP, HTTPS, SMTP, POP3, FTP, Port, and DNS. WebWatchBot 8.0.1 is a shareware program and can be used as a demo to try the software until the free trial period has ended. A full version of the program is available after the trial period ends. For security reasons, you should also check out the WebWatchBot download at LO4D.com which includes virus and malware tests. Additional screenshots of this application download may be available, too.